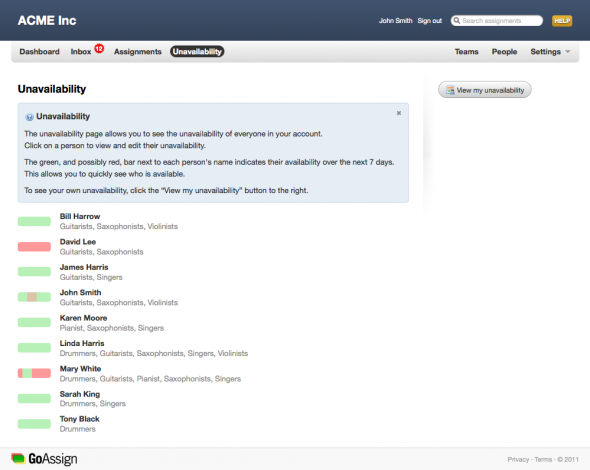 One of the feature requests we received was the ability for administrators to edit their peoples unavailability. Sometimes it's easier to make the change on someones behalf, for example if they have told you offline, rather than ask them to sign in and do it themselves. Not only editing, previously the only way to view people's unavailability was to try to assign them to something, only then to find that they weren't available. So, without further ado, we have now given you the ability to view your people's unavailability and edit it in the exact same you used to edit your own. If you are an administrator or manager you will find this new feature next time you go to your Unavailability page. You will now be presented with a list of all the people under your management and the teams they are members of. You might have noticed the green and red bars in the screenshot above. This shows the unavailability of the person over the next 7 days, which allows you at a glance to see who is available and who isn't. Once you click on the person's name the interface is exactly the same as it was previously. There is a notable exception though; managers will only be allowed to view their team members unavailability, where as administrators will be allowed to edit it also. 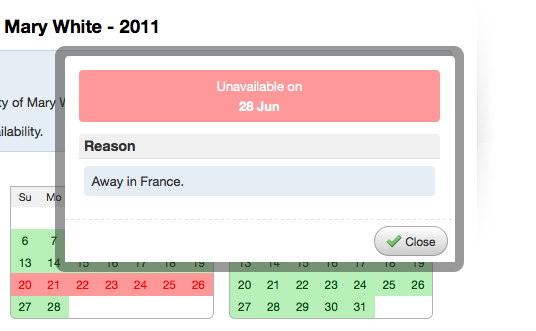 This is shown in the screenshot above where the manager can only view Mary's holiday to France and not edit it. We hope this feature makes GoAssign even easier to use and we look forward to bringing you more great features like this in the weeks to come. New Feature: Who Am I on With? Another day, another feature! This time it's one that we know a lot of people were asking for. The ability for people to see who they are on with. As you can see in the screenshot above, John can now see that he is on with David, Bill and Linda, when they start and finish and what their role will be during that time. If you're a manager and you don't want this, you can easily turn this off via your Account Settings. By default people can only see who is on at the same time and within the same team. This can be reduced though to people having the exact same role or expanded to everyone in the same account. We hope this will make easier for everyone being rostered to know what is going on when they are on. Painless scheduling and rostering for organizations and groups has now arrived to all. After 14 months of development and testing, we are proud to announce that GoAssign is now live and accepting customers. A big thank you to our private beta testers who have provided us with valuable feedback and insights into how people use the site. So where to now that we have launched? This is only the beginning! 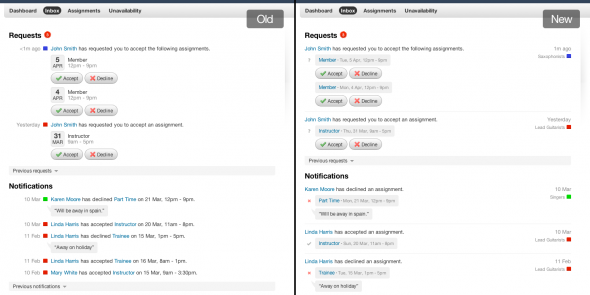 We have some great features on our todo list, some which relate to assigning people easier (imagine templates), some unavailability improvements (think overviews) and others to do with printing. We’ll be releasing more information as each feature gets closer to release. As excited as we are at improving and supporting GoAssign, we look forward to discovering the innovative ways you use it in your own organizations and groups. If you have a testimonial of your use of GoAssign that you’d like to share with the world simply let us know and we’ll post it here on our blog. If you have any feedback or need help with anything, feel free to contact us via our Support Portal. This is the first of many posts on new features as we add them to GoAssign. Why tackle the inbox before other parts of the application? Well, along with an improved look to the inbox, the update provides the same intelligent grouping to Email, SMS and RSS notifications which means you won’t be spammed when publishing large schedules and rosters. Just one of the many improvements we are making to GoAssign. Enjoy!